Which Household Names Are Set for a Career Revival in 2018-19? Will Carmelo Anthony redeem himself after a poor year in OKC? 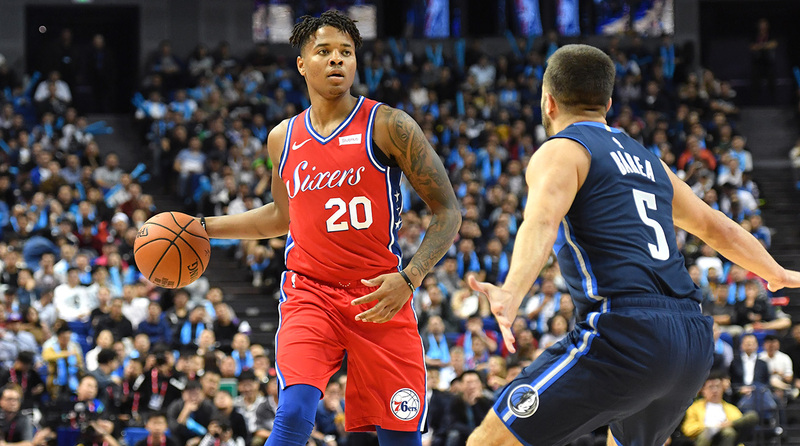 Has Markelle Fultz cleared his case of yips? The Crossover selects four candidates primed for a bounce-back year in 2018-19. With just over a week before the regular season kicks off, spirits are high throughout the NBA. The Kings are tied with the Warriors for the top spot in the West, and organizational dysfunction has yet to strike the Knicks. Even if July is the peak of optimism season, October isn’t the time to tone down one’s hopes for 2018-19. Last year’s mistakes are out of sight and out of mind. On that forgiving note, we at The Crossover have chosen four candidates primed for a bounce-back year in 2018-19. Some are in a new situation, while others are looking to get their groove back, springboarding from a disappointing 2017-18 to a season of righting the ship. So who will see a career revival this year? Here’s our top picks as opening night approaches. It doesn’t take significant time looking at the stat sheet to know 2017-18 was the worst season of Carmelo’s career. Hoodie Melo quickly gave way to clanked-19-footer Melo, leading to career lows in points, field goal percentage and made field goals. A late September trade from the Knicks prevented Anthony from crucial offseason reps with Russell Westbrook and Paul George, and the presumed third star looked more like the fifth Beatle. Anthony never got on track, relegated to the bench for key moments of Oklahoma City’s first-round defeat against Utah. So why the faith in a bounce-back year from Anthony? Well if you didn’t notice, Houston became offensive nirvana for wings last year, a gluttonous buffet of wide open threes. Trevor Ariza and P.J. Tucker are both a lot richer because of it, and Eric Gordon has found the fountain of youth. Playing with a pair of guards totalling 15 All-Star appearances pays dividends. Anthony’s shot profile in Houston won’t deviate too significantly from Oklahoma City—save for the occassional long two, which Melo apologized for after making one in the preseason—but the looks will be of higher quality. Westbrook’s whirling-dervish playmaking creates a litany of open shots, though he’s not a pinpoint passer like James Harden or Chris Paul. Instead of loading for a shot following a pass at his head or feet, expect Carmelo to catch passes right in the sweet spot, in rhythm rather than rushed as he launches from deep. 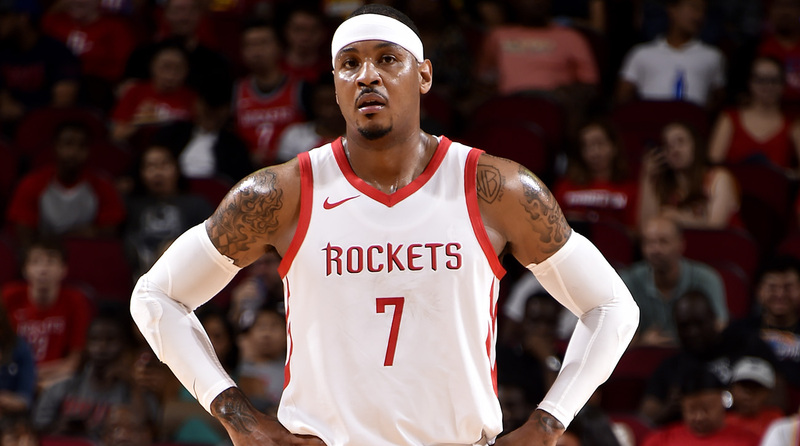 Anthony’s defensive limitations may force him to cede minutes late in games and in the postseason, with Mike D’Antoni opting for the ever-reliable Tucker or the bounce and explosion of Gordon. But Anthony’s shooting percentages should increase significantly, and the lethal scorer we remember will appear in spurts. Anthony failed to cross the 30-point threshold in a single contest last season. That will change quickly with the Rockets. Has anyone in the NBA had a longer 17 months than Isaiah Thomas? In May 2017, he was busy torching John Wall and the Wizards at TD Garden, erupting for 53 points in the Eastern Conference semifinals. The 5’9” (and that may be generous) dynamo looked in line for a big-money extension from the Celtics, potentially slated to earn over $100 million from one of the league’s premier organizations. The plan never came to fruition. Thomas injured his hip in Game 2 of the Eastern Conference playoffs in 2017, sidelining him until January of last season. In the interim he was dealt from Boston to Cleveland in exchange for Kyrie Irving, starting an ill-fated partnership with LeBron James that lasted just 15 games. Thomas was in Los Angeles by February, ending his season trying to recoup his lost value with a Lakers team looking to build for the future. IT will likely never see the same economic opportunity as he did in Boston, but his basketball future is still bright, especially in Denver, where he signed a 1-year, $2 million contract this summer. Thomas fits right in with the Nuggets blistering attack, ideally serving as a third guard with some scoring punch when either Jamal Murray or Gary Harris heads to the punch. The idea of a Thomas-Nikola Jokic pairing is delightful, and not just for the buddy-comedy potential. The eyes in the back of Jokic’s head should lead to an array of open cutting lanes, and the pick-and-roll dance with the lumbering big and the turbocharged Thomas will keep defenses on their heels. Expect Denver’s offensive rating to rank in the top three in the West, and Thomas to be a key piece in Denver’s first playoff appearance since 2012-13. Can a 20-year-old qualify for a career revival? When the youngster in question is Markelle Fultz, the answer is undoubtedly yes. The 2017 No. 1 pick had a disastrous rookie campaign, marred by the strangest case of the yips in NBA history. Fultz missed five months as he searched for a renewed shooting form, ultimately playing in the final 10 contests of 2017-18. But even after returning to the floor, the presumed third piece in the 76ers’ core looked like a shell of himself, hesitant to rise up outside of the paint, an offensive liability outside of the fast break. Philly is betting big on a bounce back from Fultz. He’s set to replace J.J. Reddick in the starting lineup, breaking up a five-man rotation (Reddick, Simmons, Covington, Saric and Embiid) that smoked teams to the tune of plus-21.4 points per 100 possessions in 2017-18. Yet even if the retooled lineup can’t reach the heights of the Reddick quintet, adding Fultz to the starting lineup is a smart move by head coach Brett Brown. Fultz’ future isn’t as a sixth man. It’s as a running mate next to Ben Simmons for the next decade. The preseason has shown the Fultz many thought Philadelphia was getting out of college. He’s been aggressive off the bounce and developed a smooth two-man game with Joel Embiid, and not just as a passer, either. Fultz hasn’t hesitated to pull-up for a midrange jumper, and he even hit a three pointer against the Magic. I’ve never seen a crowd cheer louder for a made triple in a preseason game, but after the hellish 2017-18 Fultz had, it was more than warranted. Armed with a healthy shoulder and a normal jumper, Fultz looks to have his groove back. The 76ers’ defense will be lethal if Fultz can return to his pre-injury form. The sheer length of a Fultz-Simmons backcourt should make Eastern Conference coaches shudder. The pair will wreak havoc on smaller guards, deflecting passes and generating turnovers with ease. On the other end, the two-guard pick-and-roll should be a thing of beauty, regardless of the ball handler. Defenses won’t be able to sag off Fultz if his jumper is healthy, and if he’s swarmed, good luck stopping a barreling Simmons near the tin. With considerable attention paid to Simmons and Embiid, Fultz will get a good share of open looks. He needs to be ready to make defenses pay from beyond the arc. The final piece of The Process is finally healthy, and the kids should be ready to compete for the Eastern crown. Millsap wasn’t a liability in his injury-abbreviated first season with Denver, yet he looked like a fish out of water without former Hawks head coach Mike Budenholzer. The four-time All-Star was hesitant and unsure of his role next to Jokic to start the season, far too passive in Denver’s triple-happy attack. Millsap registered his lowest field goal attempts per game since 2009-10 last season and his lowest points per game output since 2012-13, floating outside the paint rather than assert himself on the block. The 12-year veteran looked more comfortable after returning from a three-month absence in late February, efficiently pouring in 62 points in two wins down the stretch of Denver’s chase for the eight seed. Millsap began to mesh well with Jokic, with each player dishing dimes in enclosed spaces. With a pair of formidable low-post threats, Denver’s perimeter players were given the green light to launch threes with near-impunity, enjoying newfound space and freedom. The Nuggets sported the NBA’s sixth-best offensive attack, and while they fell one game short of the playoffs, they found their true offensive identity behind Jokic as the focal point next to a complimentary Millsap down the stretch. Despite his canny offensive game, Millsap will make his biggest impact on the defensive end. Denver’s defense often looked like a series of turnstiles last season, allowing over 120 points a whopping 17 times en route to the No. 25 defensive rating in the league. Nobody will mistake the Nuggets for the Jazz, but at times Denver’s defensive effort was laughable. That will change with Millsap. He ranked in the 95th percentile as a post defender in his final season with Atlanta per Nylon Calculus, using his 246-pound block of a body to force taller bigs out of their comfort zone. Millsap is heady and versatile, rarely blowing an assignment and capable of stretching out to the perimeter. He’ll be the linchpin of Mike Malone’s defense, and if Denver can be close to league average on that front, 50 wins is well within reach. The feeling-out period is over; now it’s time for Millsap to pair with Jokic and form one of the league’s top frontcourt duos.